A parked decoy cruiser was shot at multiple times early Wednesday in the Cutler Bay area, Miami-Dade police confirm. Police received a call just after 1:00 a.m. about shots fired. When they arrived at the car, parked just outside a house at 19711 Gulfstream Rd., officers saw that the MDPD cruiser had been shot at multiple times. One bullet went through the cruiser and struck that house. Two people were inside the house at the time but thankfully no one was hurt. The decoy vehicle was not occupied and does not belong to anyone. Police say the unoccupied decoy cruiser is used to curb speeding. 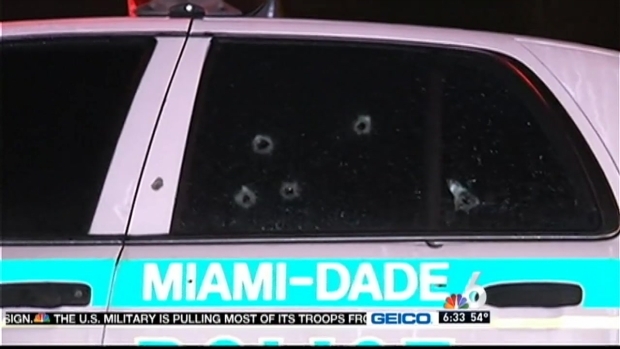 For the second time in two weeks, an unoccupied Miami-Dade police cruiser was found riddled with bullets. Julia Bagg is in Cutler Bay where the latest incident occurred. This is the second incident of this type in just two weeks. On January 29, an MDPD cruiser was shot out as it was parked outside the home of an officer in southwest Miami-Dade.